I was interested to note that an acquaintance of yours living in Nottingham, frequently visits my Sister’s pub. If you will let me know the name of your friend, I shall mention it to my sister in my next letter. She used to be in the dramatic business, never played the Halls. She & her husband run a little pub in a place called Bollesford (Notta), they have been there several years now. For people having troubles, I agree with you that Chaplin doesn't have any - financially, but nevertheless, he is a very unhappy man, & mentally troubled, you can rest assured, success & Worldly goods do'nt insure happiness & content, & there are many others in the same situation. I deeply appreciate your kind sentiments Ed regarding Mr Hardy & myself, I feel very gratified that we finished up in such high esteem with the public & our many countless friends. Your kind thoughts are greatly valued. Note you don’t get out much due to not having the energy - its the same with me Ed, I get terribly tired when I walk a short distance, & its all I can do to get back home. If its necessary for me to go somewhere - like the Dr. etc. Mrs L drives me in the car, & even that tires me very much & makes me very nervous. I don’t drive myself anymore, being in my condition, I’m afraid to take any chances, especially as there is a great deal of heavy traffic here & so many bad accidents. Well not much to tell you Ed, so all for now. Mrs L. joins in every good wish to you & yours. Pleased to note you enjoyed seeing "Fra Diavalo", its strange, it has'nt been shown out here for some reason, I would like to see it again, especially sans commercials. Glad you & your friends got a kick out of the tape recording I sent you, I often wish that sketch had been filmed so you could have seen the action of it. I shall be pleased to send you another Tape, but it may be quite a while before I can get one re-recorded for you, as I need another machine to do this & my friend is not in Town anymore, so will wait till I can borrow another outfit. Bye for now Elmer, it was nice to hear from you again. We had the same doubles for years. They didn’t look like us facially, but their build was approximate—one fat and one thin. In make-up there was great resemblance at a distance, and they acquired our mannerisms, which made them pretty convincing in the long shots. Thanks your welcome letter 1st.inst. Pleased to note my letters afford you so much pleasure & interest, I can assure you I too get a great deal of pleasure & enjoyment out ot my correspondence with you & look forward to your letters, so I guess its a mutual situation. I got a kick out of the'Expense Memo' - very funny, it certainly clearly tells the story this sounds like an accounting of Dave Beck, (The Teamsters Boss). Mrs Laurel too got a bang out of it & enjoyed reading it - wonder 'Nho thinks up these things, they have a great sense of humor. Yes, George Raft has quite a background, have met him several times, last time was in Paris, France in '50. I appeared on the same radio show with him which was broadcast throughout Europe - I doubt if they understood my lousey attempt to speak French. Babe was'nt with me as I had gone over ahead of him a few weeks to make preparations on the picture - story etc. so I was requested to appear alone for some publicity purpose. Am afraid I can't share the excitement with you on the world series, I have'nt the slightest interest in baseball, have never even seen a game played, so do'nt know what its all about, for some reason it had no appeal to me, theres a great deal of fuss here about the Brooklyn Dodgers coming to L.A. that seems to be the most important news in the papers here. It was certainly interesting to hear about that college kid recording the news from the radio during the time he was in school, its really amazing the many uses you can get out of a tape recorder, they sure are a wonderful machine to have. Note you have'nt a TV set. I sold my old one when I rented the house, & bought a G.E. portable (14 inch) its a swell little outfit & gives a very clear picture - surprising at the price - a hundred & thirty Dollars I paid for it. However, our reception in this location is'nt too good on account of the mountains surrounding this area, so we only get three stations which are relayed from San Diego & a lot of times we get a great deal of interference which makes it very bad for us, otherwise the picture is beautiful & clear as a bell. Thats the only objection to living here,am afraid we shall have to move again after the lease is up next June, as Tv 1s a necessity to me, & I feel lost without it. The stack of hay you mention in 'The Bullfighters' was a prop, a frame was built on rockers & covered with hay, our doubles worked on it in the long shots & we made the close-ups. Regarding the stand-ins, doubles & stunt men, it is a demand from the insurance Co's that all important players are to be protected from getting hurt, to avoid holding up production, in which case the insurance Co would have to bear the cost of the delay, so they wo'nt permit any chances. We had the same doubles for years, they did'nt look like us facially, but their build was approximate, one fat & one thin, & in make-up there was great resemblance at a distance & of course they acquired our mannerisms which made them pretty convincing in the long shots. During times they were'nt working with us (between pictures) they would pick up extra work in other films & return to us whenever we were ready to start a new film. Note you found out where Dianna Durbin was, I had an idea she had married & retired, do'nt know if she is living in France on account of the Dollar exchange if she is in Paris its very expensive indeed, living is very high, especially for an American. I fully understand re the local people being tight with their money, its funny how their attitude changes when you want to buy something from them, they sure put great value on their posessions. Yes, I finally got caught up, all that mail was sure a job, glad its over with. Enclosed is a little cartoon, sent me from Canada, thought it was cute. Looks like 'Cindy' is getting to be a handfull & keeping you busy. Glad to know she is well & happy. Well think thats the lot for now Earl. Mrs L joins in kindest regards & every good wish to you all. I just recd. a letter from Billy Barron, giving me the sad news that his Dad Bennie had recently passed on. Thought I'd let you know in case by chance you had'nt heard about it. I have dropped a line to Jack Graham expressing my sumpathy. Poor Bennie, he was a sweet fellow, I was terribly sorry to hear about it, but I imagine the end was to be expected at his age. God Bless him. Well, another link out of the chain of friendships gone - 'Time Marches On'. Hows everything with you Trixie? trust alls well & happy. Eda joins in love & kind thoughts, take good care of yourself dear. My love to Dolly when you see her. Have just received a copy of your wonderful eulogy to my dear late partner Olly, which Leonard Jones so kindly sent to me. It is difficult for me Charlie to express my deep appreciation for your kind and sweet thought, in creating this beautiful tribute, but I want you to know I feel very grateful to you for the lovely sentiment. My sincere thanks Charlie. Am having it framed. Trust all's well and happy with you, wish you continued success. Charlie Chester was named “Poet Laureate” of the “Grand Order of Water Rats” in 1953. Part of his responsibilities included writing a tribute for members when they passed away. The tributes were then ceremonially read aloud behind a vacant chair at the Lodge. I have to agree with you re Chaplin being mean and cheap. To my mind, he is still the greatest artiste in his field, but unfortunately his ideals have run amuck. 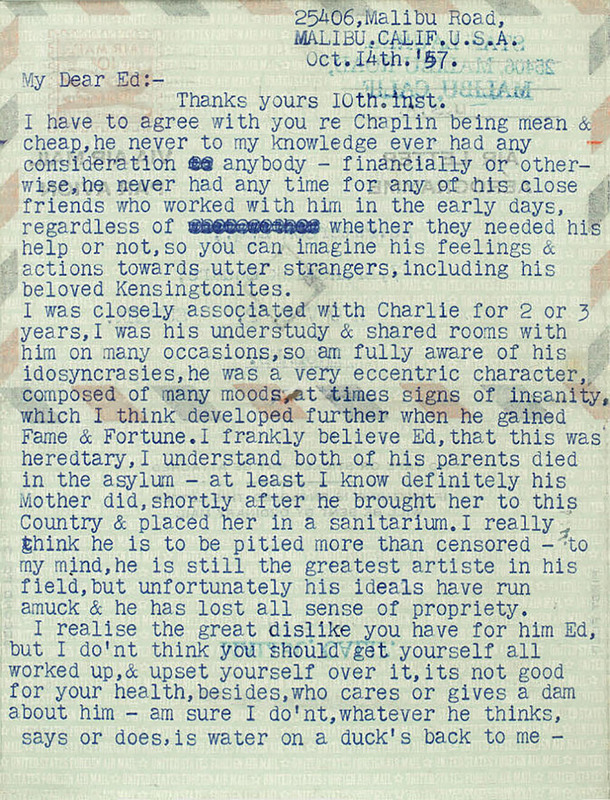 I have to agree with you re Chaplin being mean & cheap, he never to my knowledge ever had any consideration to anybody - financially or otherwise, he never had any time for any of his close friends who worked with him in the early days, regardless of whether they needed his help or not, so you can imagine his feelings & actions toward utter strangers, including his beloved Kensingtonites. I was closely associated with Charlie for 2 or 3 years, I was his understudy & shared rooms with him on many occasions, so am fully aware of his idiosyncrasies, he was a very eccentric character, composed of many moods, at times signs of insanity, which I think developed further when he gained Fame & Fortune. I frankly believe Ed, that this was hereditary, I understand both of his parents died in the asylum - at least I know definitely his Mother did, shortly after he brought her to this Country & placed her in a sanitarium. I really think he is to be pitied more than censored - to my mind, he is still the greatest artiste in his field, but unfortunately his ideals have run amuck & he has lost all sense of propriety. I realise the great dislike you have for him Ed, but I do'nt think you should get yourself all worked up, & upset over it, its not good for your health, besides, who cares or gives a dam about him - am sure I do'nt, whatever he thinks, says or does, is water on a duck's back to me - with all his millions we are happier than he is I'll guarantee, & one thing for sure, he go out the same way he came in, with nothing & without friends too, there'll be no tears shed. I didn't hear anything about Mack Sennett being in hospital - thats news to me. Interesting to note you are collecting cut-outs from old films, I remember very well when Billy Reeves made some comedies for Lubin Co. they were made in Florida, I think severeal of the old Karno boys were in them too. Am not surprised to hear re Fred Karno Jr. being in trouble - he always has been! through all the years I've known him, he sure threw away some wonderful opportunities when his father was alive, if he had behaved himself he would have acquired all those shows, but he was too fond of the four-ale bar dept. Incidently, I met his Landlady wife in '54. she seemned a very pleasant person. Thanks for your kind remarks re my Sister, am pleased she is so well thought of. Am writing her today & will mention the names of your friends Syd & David. Yes, I understand TV is doing a lot of damage to the theatre business, especially the Provinces, its certainly a shocking situation for all those Variety artistes who are thrown out of work - its really serious. Well, all for now Ed. Mrs L. joins in kindest regards & every good wish for health & hapiness. Take care of yourself. Hannah Chaplin (1865-1928) was was the mother of Charlie Chaplin and his two half-brothers, actor Sydney Chaplin and the film director Wheeler Dryden. When Charlie was 14, his mother was committed to a mental asylum. In 1921, she was relocated by Charlie to California, where she was cared for in a house in the San Fernando Valley until her death. Charles Chaplin Sr. (1863-1901) was an alcoholic who died at 38 years old, from cirrhosis of the liver. Mack Sennett (1880-1960) was a director and actor known as an innovator of slapstick comedy in film. He was hospitalized on June 14, 1957 and underwent an operation on his prostate. Ex-Karno comedian Billy Reeves (1864-1943), who perfected a Charlie Chaplin imitation, joined the Lubin Company in 1915. Lubin films showcased the first film appearance of Oliver Hardy, who started working at Lubin’s Jacksonville, Florida studio in 1913. Thanks dear yours of the 14th.inst. I wrote you a few days ago in regard to Bennie Barron - guess our letters crossed. I was pleased to know that Bennie passed on peacefully without suffering — God bless him, but I can imagine it was a great shock to his daughter, being so unexpected. I was going to drop a line to Jackie Harrison to let him know the sad news, but am not sure if Jackie knew Graham & Barron or not. We are having a flu epidemic here too, in some parts of the Country its pretty serious, quite a few deaths, the government has requested everybody to take shots to avoid it spreading, hope you are taking precaution against it. Note re the high cost of living - the prices here for food are really shocking, terribly expensive, its really getting out of control, I don't know how people with families manage, there's only two of us & it costs over £10. a week for groceries alone & we are not big eaters. Was surprised the Empire is still open - so many of the theatres in the Provinces have closed up - a lot of the artistes I know have had to quit the business, they can't exist on the small amount of work there is left, & what they do get doesn't pay them enough to make ends meet its a sad situation. Think thats all for now dear. Eda joins in love & fond thoughts - take good care of yourself Trixie. Yes, George Raft has quite a background, have met him several times, last time was in Paris, France in '50. I appeared on the same radio show with him which broadcast throughout Europe - I doubt if they understood my lousey attempt to speak French. Babe was'nt with me as I had gone ahead of him a few weeks to make preparations on the picture - story, etc. so I was requested to appear alone for some publicity purpose. Yes, I recd. your cards & letters OL. my delay in answering them was unavoidable, due to the fact that I have been very busy acknowledging condolence letters & messages from all over the World regarding the loss of Mr Hardy - had very little time for personal correspondence - trust you will understand. Note you have taken snapshots of the club, I shall be very interested to see them when you have them finished. Regarding a L&H Correspondence Club, I have no objection Gary, but I think it would be better to call it the "GARY ARNOLD MAIL CLUB" & keep it seperate from the L&H Club which you already have. However, its just a suggestion. No, I have'nt any snapshot of myself taken recently - shall be pleased to send you one next time I have one made. My address has'nt changed, I do'nt just bother with the 1/2 number as the postman now knows where I live - the whole building is 25406, the added numbers are the different apts. We too have been having a little rain & slightly cool, I like it for a change. All for now Gary. Take care of yourself. 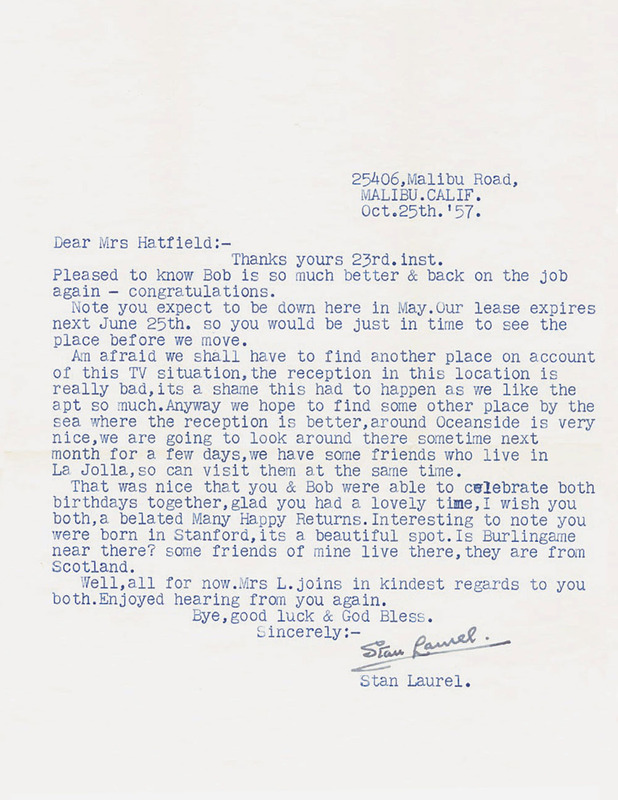 “...the postman now knows where I live.” The actual address of Stan's apartment was 25406-1/2. The building on Malibu Road housed four apartments numbered 25406, 25406-1/2, 25408 and 25408-1/2. 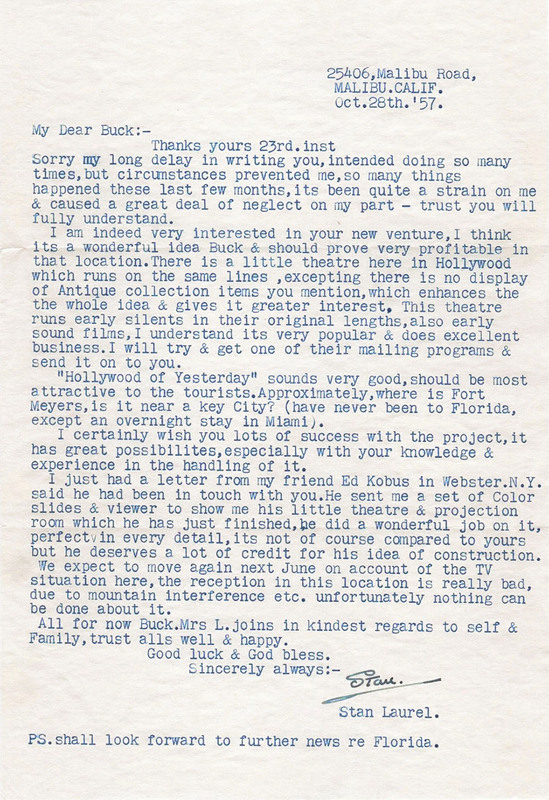 Stan stopped used the “1/2” in his correspondence midway through 1957. 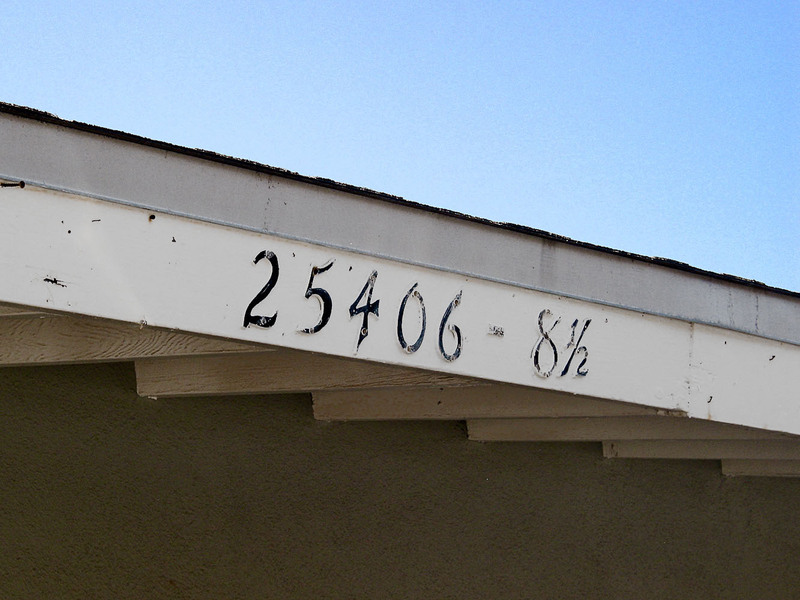 The apartment still retains that odd numbering above its entryway. Pleased to know Bob Is so much better & back on the job again - congratulations. Note you expect to be down here in May. Our lease expires next June 25th. so you would be just in time to see the place before we move. Am afraid we shall have to find another place on account of this TV situation, the reception in this location is really bad, its a shame this had to happen as we like the apt so much. Anyway we hope to find some other place by the sea where the reception is better, around Oceanside is very nice, we are going to look around there sometime next month for a few days, we have some friends who live in La Jolla, so can visit them at the same time. That was nice that you & Bob were able to celebrate both birthdays together, glad you had a lovely time, I wish you both, a belated Many Happy Returns. Interesting to note you were born in Stanford, its a beautiful spot. Is Burlingame near there? some friends of mine live there, they are free from Scotland. Well, all for now. Mrs L. joins in kindest regards to you both. Enjoyed hearing from you again. Thanks yours 23rd.inst. regarding the L&H stickers, I doubt if I could let you have very many Gary, am getting low on these, & when finished I won't be ordering anymore. How many do you think you will need? There are no prices on them as they were made for private use, mainly autograph books. Interesting to hear about your newspaper idea, that will mean a lot of work for you, if you have a spare one, I would very much like to have a copy. Bye Gary. Lots of good luck. Sorry my long delay in writing you, intended doing so many times, but circumstances prevented me, so many things happened these last few months, its been quite a strain on me & caused a great deal of neglect on my part - trust you will fully understand. I am indeed very interested in your new venture, I think its a wonderful idea Buck & should prove very profitable in that location. There is a little theatre here in Hollywood which runs on the same lines, excepting there is no display of Antique collection items you mention, which enhances the whole idea & gives it greater interest. This theatre runs early silents in their original lengths, also early sound films, I understand its very popular & does excellent business. I will try & get one of their mailing programs & send it on to you. "Hollywood of Yesterday" sounds very good, should be most attractive to the tourists. Approximately, where is Fort Meyers, is it near a key City? (have never been to Florida except an overnight stay in Miami). I certainly wish you lots or success with the project, it has great possibilities, especially with your knowledge & experience in the handling of it. I just had a letter from my friend Ed Kobus in Webster, N.Y. said he had been in touch with you. He sent me a set of Color slides & viewer to show me his little theatre & projection room which he has just finished, he did a wonderful job on it, perfect in every detail, its not of course compared to yours but he deserves a lot of credit for his idea of construction. We expect to move again next June on account of the TV situation here, the reception in this location is really bad, due to mountain interference etc. unfortunately nothing can be done about it. All for now Buck. Mrs L. joins in kindest regards to self & Family, trust alls well & happy. PS. shall look forward to further news re Florida. Our TV situation is just the same—really awful. We shall definitely leave here when the lease is up next June. I would get out now if it were possible. Sorry to hear the Flu has been so active in your parts, I understand we are getting a good share of it put here too, so far we have been fortunate in escaping it, of course we do'nt come in contact with many people & I think the sea air probably blows the germs away around this section. You are lucky you did'nt get it, being so much among the public every day, I imagine you got a shot of vaccine to avoid getting caught. I got a kick out of Cindy's picture, she sure is cute, the pram is a good idea in helping her to walk. Re the guys fighting in open touring cars, thats made effective by the speed of the camera, the cars are actually going slow & many time are attached to the camera truck or some other vehicle when they make side view shots - also done by placing the cars in front of a screen, which in back, a picture of the moving Countryside or Street is projected & the whole thing is photographed from the front. Of course in the old comedy days a lot of this was actually done, & quite risky at times. Andy Clyde is still around, but not doing a great deal, I've known Andy for many years - his Dad was a well known Scottish actor & was a very close friend of my Dad, John Clyde for several years used to play a Scottish season at my Dad's theatre, the Metropole in Glasgow, his first week's show was generally "Rob Roy", he was really wonderful in that part, he was tall & heavy set - looked the character perfectly. I know Billy Bevan too, he's an Australian. Bill has been in retirement for a long time, I believe he has a very profitable avacado ranch somewhere near San Diego. I think he works in films occasionally whenever they need him. Roddy McDowell I understand is directing or co-producing some shorts for TV, have never seen any of them, so do'nt know too much about it. I certainly got a bang out of your description of the Lady that owns the restaurant - I think she's got Jack Benny topped for thrift - what a character, its amazing. She sure had a lot of gall regarding the roll of film. Your thought of moving to Arizona sounds very interesting. I was in Pheonix one time, liked it very much, its a lovely State passing through on the train, frankly do'nt know much about it as far as being in business is concerned. Phoenix seemed to be a prosperous place & lots of activity - are you thinking of moving to Arizona permanently?. If I owned the place here I might go for it, but only renting, it would be foolish. I started to read 'Something of Value', but the print is rather small & hard on my eyes, so will have to take time on it. On account of the TV being so lousey, I have to listen to the Boxing on the radio, so do'nt get much excitement with it, they have sounded pretty dull of late. Mrs Hardy dropped in to see us about a month ago, she was going to live with her sister in Palm Springs till she gets herself straightened out, then expects to return to her former work again (Stenographer) She did'nt look too good, but am sure a good rest will do her good & put her back in shape. Bye Earl, Mrs L. joins in all the best to self & family. Dear Marie and Claude [Cingalee]: thank you so much for your sweet letter and, believe me, I especially appreciate your taking the time to write -- you of all people when you have your own sadness and worry. We were both so very upset and sorry to hear of Claude's illness when you wrote us quite some time back but I was so upset over Babe at the time that I was afraid I would only upset you more by sounding gloomy and worried myself. That is why I sent your letter to Stan and asked him to write and try to cheer you both up and give you our love. Still, I felt very guilty not answering myself, but, as I am sure you now understand, I just couldn't compose myself enough to be able to sit down and write. My poor darling Babe suffered for such a long time. He was never well from the time we returned home from our last trip over there and he was in and out of the hospital so many times, but we kept out of the papers, up until the time of his stroke, because he didn't want anyone to know he was ill and, two, there was a big TV deal pending. After returning home in the summer of '54, he was in the hospital in October with a kidney infection. The following April '55 he had his first heart attack and following that, several bouts with pneumonia, a gall bladder attack, and a series of heart attacks and the last year, his stroke. I really lost my Sweetheart that morning in September last year - because poor Babe was never Babe after that. It was a thrombosis in the left frontal lobe, which left him completely paralyzed on the right side, unable to speak, completely helpless with a great deal of brain damage, requiring constant care of nurses 24 hours a day. All of the doctors and specialists told me from the start, that is after the stroke, that there was no hope. There were so many other complications too - gall bladder, liver, kidneys, partial paralysis of the digestive tract. They were all amazed that he lasted as long as he did -- that seemingly endless eleven months' long nightmare. If it were only just that -- a nightmare! I was just numb for a while afterwards. But still I knew then, and I know now, that it was for the best and I give thanks each day to a Merciful God -- thanking Him for making my Darling Babe whole and well again in Heaven - since he couldn't get well here on earth. When I find myself depressed and dwelling on things, Iremind myself of these things. Too, I know that I have something very precious - something that a lot of people in this world have never known or experienced - my wonderful memories of the beautiful, love-filled, happy years we had together. That is something I will always have and nothing can ever take from me. And truly My Darling is really closer to me now then he ever was during those last eleven months. I am visiting here with my Sister, her husband and their nine-year-old Ricky for a while. They are so wonderful and make me feel so much like I belong and I am starting to feel much calmer and more relaxed. Babe and I used to enjoy coming here to visit with them and I know he is happy that I am here with them now. So I'm just going to stay here for a while with them - rseting, swimming and sunbathing - until my thinking gets straightened out, before I decide what I'm going to do. Thank you again, my Dears, for your thoughtfulness and kindness....Also your many, many kindnesses to us when we were over there. Dear Babe and I used to talk so often of the wonderful times we used to have together and relive those happy moments over and over again. I can't tell you how much I admire the courage and stamina of both of you during what I know must be a truly trying time for you....And I think it is absolutely wonderful that you work from time to time....That's what it takes -- the will and fortitude to carry on. It's so very important. So, chin up, My Dears, and you'll lick this thing and conquer all. Do drop me a line when you have the time and I do hope by then things will be improving and "looking up". Give my love to the rest of the family. And always know that you have my very best wishes for your health and happiness. Thank you so very much for your sweet letter and, believe me, I especially appreciate your taking the time to write -- you of all people when you have your own sadness and worry. We were both so very upset and sorry to hear of Claude's illness when you wrote us quite some time back but I was so upset over Babe at the time that I was afraid I would only upset you more by sounding gloomy and worried myself. That is why I sent your letter to Stan and asked him to write and try to cheer you both up and give you our love. Still, I felt very guilty not answering myself, but as I am sure you now understand, I just couldn't compose myself enough to be able to sit down and write. My poor Darling Babe suffered for such a long time. He was never well from the time we returned home from our last trip over there and he was in and out of hospital so many times, but we kept it out of the papers, up until the time of his stroke, because he didn't want anyone to know he was ill and, too, there was a big TV deal pending. After returning home in the summer of '54, he was in the hospital in October with a kidney infection. The following April '55 he had his first heart attack and following that, several bouts with pneumonia, a gall bladder attack, and a series of heart attacks and the last year, his stroke. I really lost my Sweetheart there that morning in September last year - because poor Dear Babe was never Babe after that. It was a thrombosis of the left frontal lobe which left him completely paralysed on the right side, unable to speak, completely helpless and with a great deal of brain damage, requiring constant care of nurses 24 hours a day. All of the doctors and specialists told me from the start, that is after the stroke, that there was no hope. There were so many other complications too - gall bladder, liver, kidneys & partial paralysis of the digestive tract. They were all amazed that he lasted as long as he did -- that seemingly endless eleven months' long nightmare. If it were only just that -- a nightmare! I was just numb for a while afterwards. But still I knew then, and I know now, that it was for the best and I give Thanks each day to a Merciful God -- thanking Him for making My Darling Babe whole and well again in Heaven - since he couldn't get well here on earth. When I find myself getting low and depressed and dwelling on things, I remind myself of these things. Too, I know that I have something very precious - something that a lot of people in this world have never known or experienced - my wonderful memories of the beautiful, love-filled, happy years we had together. That is something I will always have and nothing can ever take away from me. And truly My Darting is really closer to me now than he ever was during those last eleven months. I am visiting here with my Sister, her husband and their nine-year-old Ricky for a while. They are so wonderful and make me feel so much like I "belong" and I am starting to feel much calmer and more relaxed. Babe and I used to enjoy coming here to visit with them and I know he is happy that I am here with them now. So I'm going to stay here for a while with them - resting, swimming and sunbathing - until my thinking gets straightened out, before I decide what I'm going to do. I can't tell you how much I admire the courage and stamina of both of you during what I know must be a very trying time for you....And I think it is absolutely wonderful that you work from time to time....That's what it takes -- the will and fortitude to carry on. It's so very important. So, chin up. My Dears, and you'll lick the thing and conquer all. Drop me a line when you have the time and I do hope by then things will be improving and "looking up". Give my love to the rest of the family. And always know that you have my very best wishes for your health and happiness.